GoPro action cameras are good but they're quite expensive! The current flagship model, the GoPro Hero 7, is currently around £360. That's quite a lot of cash. Luckily, you don't have to spend a fortune nowadays to buy an action camera because some manufacturers have started producing thier own high-quality, low-cost GoPro Alternative cameras for about £60 on Amazon. Here we offer some outstanding and affordable GoPro style camera options that you can buy here in the UK- including some 4K HD models - which are great value and have similar features to a GoPro. Camera technology is getting cheaper, and you no longer need to pay a lot for 4K video recording capabilities. The best action camera deal at the moment is the Akaso EK7000 4K HD from Amazon at only £60. Its specifications are not as impressive as GoPro Hero line-ups, but the Akaso is still a good camera. This small device records 4K video at 30 frames per second or 1080p at 60fps and has a 12MP image sensor for 4K resolution photos. The 170-degree wide-angle lens ensures that the camera does not miss anything. The unit comes with a variety of fasteners and a waterproof housing that works with other accessories to a depth of 120 feet. It also comes with two 1050mAh batteries, each giving up to 90 minutes of battery life. Kicking off the rest of our GoPro alternative offers is the excellent Yi 4K action camera. Yi is a strong GoPro competitor and the company has recently met GoPro for a contract for Google's ongoing VR project. 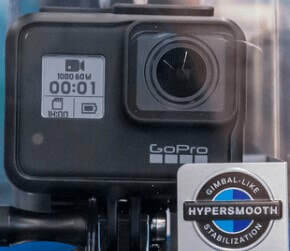 In the same way as Hero or Hero 5, this camera can record 4K video at a frame rate of 20 frames per second or 1080p at 60 frames per second for true HD video quality and image stabilization. A 150-degree wide-angle lens records all actions, while the 2-inch full color touch screen shows everything that's happening right now. Wi-Fi connectivity makes it easy to sync with your mobile device so you can manage your photos with the Yi Action app. If you have a young or aspiring adventurer in your family, check out the child friendly Kidizoom from Vtech. This easy-to-use action cam takes both video and still images and contains pre-programmed filters and editing effects to further improve your memories. Kidizoom comes with a strong case that is waterproof up to 6metres - perfect for the beach or pool - it is also equipped with both a bike mount and adhesive bracket (flimsy looking though). It's not quite a Hero 7 Black, but with a low price it's a good, budget action camera for aspiring young adventurers. The Intova Dub has been specially developed for adventure, thanks to a waterproof case for when at the beach, the ocean or just in the pool - to a depth of up to 200 feet. Even better is the floating case, so if you drop the camera in the water, it's safe and easy to find again. The Dub has full HD 1080p video with 108-degree lens and a 1.5-inch LCD screen. The internal battery lasts for up to two hours before charging it, and the lost hole on the camera is compatible with accessories and accessories available. Intova Dub is usually offered by most retailers for not a lot of money making this action camera is a high spec and incredibly low-priced GoPro option. Sony has also entered the action cam market in recent years, and its range of small video recorders offers a unique and not too expensive alternative to traditional designs. The HDR-AS50 Action Camcorder is specially designed for mounting on a variety of outdoor appliances, from helmets to bikes. Unlike other cameras with built-in touch screen, the Sony model comes with a direct-access remote control that is connected to your wrist and a heads-up display and control hub offers wherever it is appropriate. The HDR-AS50 also produces sharp 1080p video at 60 fps or 720p at 120fps and uses a 12MP sensor for photographs. A budget version of the Sony camcorder is the Ion Cool-iCam S3000, which offers a similar lookform factor that is ideal for mounting on bikes, vehicles, watercraft etc. Cool-iCam can record 720p HD video at 30 fps and take 5MP images. The camera is waterproof to depths of up to 10 metres without the need for a separate case and has a battery life of up to 120 mins. There is also a pretty good bike mount, and at this price it is a nice choice for a cycling camera for children and teens. The ion Cool iCam S3000 Action Cam is one of the most affordable GoPro clones of its kind. Polaroid Cube Action Cam - Polaroid is best known for its classic fast-paced cameras, but the company has managed to keep track of time by offering its own line of affordable GoPro like options that carry the iconic rainbow-shaped Polaroid design. The Polaroid Cube 1080p camera is as attractive as affordable with a 124-degree wide angle lens and a robust, splashproof rubberised housing. The Polaroid Cube is compatible with a variety of fasteners, but it also has built-in magnets for easy mounting on metal surfaces. The Black Polaroid Cube Action Camera comes from Amazon at a nice low price too. Disclaimer: We ( GoPro Alternative UK ) may get paid a small commision from anything you buy through any link on this site. You still pay the same price as normal but we get a few percent that helps us maintain this website.